I’ve said before that the piecemeal storytelling of individual episodes isn’t doing The Walking Dead Season 7 any favors, especially with only two episodes left in 2016 after tonight’s “Swear,” and no explicit sense of how Negan and the Saviors will fit into the series going forward. Still, so long as the first half of Season 7 was going to catch us up on one group of characters at a time, Heath and Tara were arguably the most in need of spotlight. As “Swear” helpfully reminds us, these two have only been gone two weeks in-story, but completely missed out on Denise’s death, Carol and Morgan’s exit, Negan’s skull-crushing introduction, subsequent visit to Alexandria, Daryl’s imprisonment, and much more. The other elephant in the room is that of Corey Hawkins’ impending commitment to FOX’s 24: Legacy, and since “Swear” appears to have written Heath out (without killing, thankfully), it’s strange the hour would be told from Tara’s perspective. There’s nothing explicitly draining about Tara as a character; she’s one of the few without comic roots tethering her to any specific story, and her tendency to lighten the mood with nervous quips is a refreshing change of pace in small doses. I can understand the impulse to write “Swear” off as “LOL, a Tara episode” (and if Season 7 ratings are any judge, plenty will be doing just that), but stranger still is the choice to introduce yet another new community, one not even the comics have physically traveled to. On the one hand, I like Oceanside; the design feels more visually distinct than either Hilltop or The Kingdom, and the choice to populate the community with all-women is an interesting one, even if “Swear” doesn’t really make any significance of it. If anything, the decision to introduce Oceanside appears to have been a moral one; to contrast their insistence on killing any and all outsiders* with Heath and Tara’s guilt for slaughtering the Saviors at the satellite outpost. 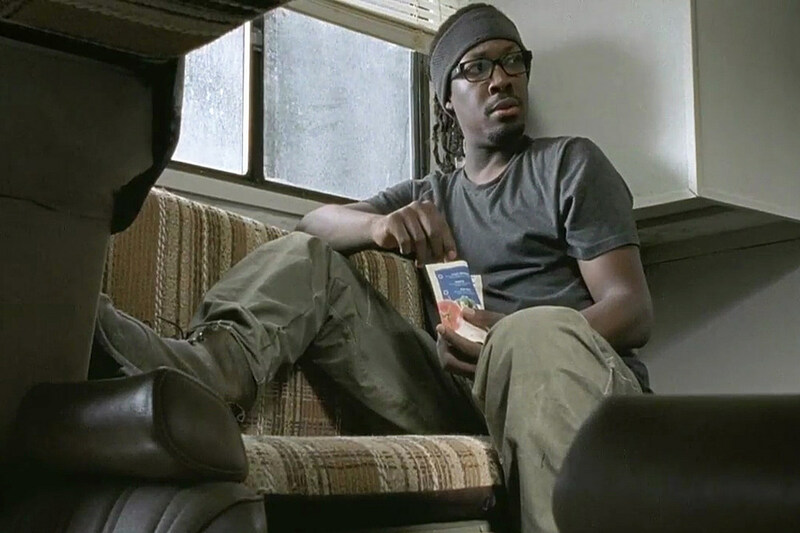 The incident clearly weighs more on Heath than Tara, but I’m less certain why The Walking Dead wants to dredge up the same ethical questions from Season 6, especially given what we know of the Saviors’ unyielding menace now. *I presume the plan was always to kill Tara in the woods, at least after they realized Saviors would seek retribution for Tara’s people attacking the Savior outpost? Was the walker in the woods intended as a momentary distraction for Tara? When did she figure that out, and decide to run? Granted, it's not the least believable thing wrapped around one's head. And that might actually be why “Swear” feels like an unlikely success in such an otherwise-unfocused season. Tara has no real concept of Negan or the Savior threats we’ve been subject to in the last six episodes; ostensibly winding back the clock to a different era of the series. No armed, generic extras show up to make any imposing or vile demands, and the extra screentime even affords a few moments of levity from Tara’s return home, at least until Eugene’s blubbering visage welcomes her at the gate back to crushing reality. I’d hope Tara doesn’t get lost in the sludge of Season 7 by her return to Alexandria, and presumably the titular “Swear” explains her decision to protect Oceanside’s secret, rather than take Rosita’s offer to help spark a rebellion. You’d think learning of Denise’s death would reset those priorities, but no one in The Walking Dead appears to be making any overtly rational decisions in the wake of Negan’s takeover. What then, was the point of spending an entire Season 7 episode introducing Oceanside? Hopefully, we’ll find out. This was especially noticeable with Enid facing a lone walker on the open road last week, but The Walking Dead could really use work blocking scenes of walker attacks. There was plenty of room for Tara, Heath or Cindy to move around or evade the walkers on the bridge, atop the fact that they were, you know, on a bridge. Worst case scenario, get a little wet! 10:1 odds on someone theorizing Fear The Walking Dead will connect to Oceanside? So Heath just … what, decided to leave Alexandria behind (and take the RV) on principle? Is there a “PPP” significance I’m blanking on? I appreciate the decision not to kill Heath off, but less so the “eh, we’ll wait to see if 24: Legacy lasts” attitude. That was some … oddly upbeat music as Tara followed Cindy back to the community. Is Rachel now leading contender for Most Annoying Child Deserving of a Walker Bite? What exactly happened at the bridge? Bunch of bald guys tried to build something, and accidentally dropped a mountain of sand on themselves? Or was the sand an attempt to bury incoming walkers, and then whoever used the shell casings fled anyway? It is 1000% insane that no one on The Walking Dead has previously thought to build their community by a body of water. Plentiful fishing, easy escape! Were they laying groundwork for a Cindy-Tara romance, before Tara even knew Denise was dead? The Walking Dead Season 7 will return December 4 with “Sing Me a Song,” airing at 9:00 P.M. on AMC.